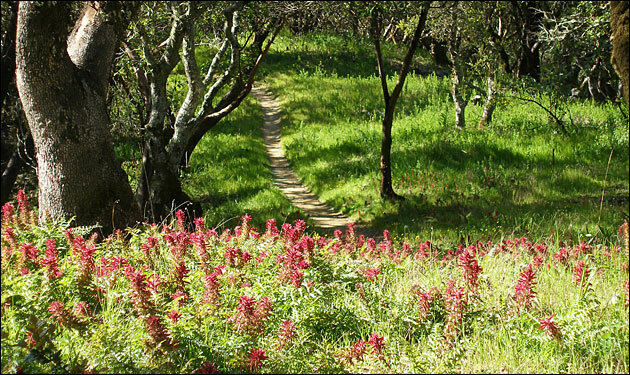 The Marin County Open Space District manages 34 different parcels of land throughout the county, totaling over 18,000 acres. Included in these open spaces are representatives of nearly all the major habitat types found in Marin County, from tidal wetlands to redwood forests. The District is challenged with protecting valuable open space, providing recreational experiences for park users all while physically interfacing with approximately a quarter million residents in the county. To this end, fuel breaks and fire management strategies are planned in critical sections of district land, slated to total 58 miles in length upon completion. In 2008, Shelterbelt was hired to conduct an in-depth assessment of the state of Marin County Open Space District's fuel breaks as they pertain to the area's natural resources. Shelterbelt biologists hiked the majority of these parcels, mapping the various vegetation types and weed populations therein. The ultimate aim was to make to make both general and site-specific management recommendations by combining updated, on-the-ground assessments with extensive secondary academic research. In doing so, Shelterbelt created a comprehensive report which laid the groundwork for managing County lands to maximize preservation of the many unique native plant communities while maintaining focus on safeguarding County residents from wildfire. Following the initial report, Shelterbelt continued to map the remainder of District property and monitored the status of newly-installed fuel breaks. Biologists hiked these parcels, identifying and mapping problem weeds, enabling the district to have an updated picture of the state of their resources and to prioritize their management objectives.